Encore D/C makes core buildup easier and better. Encore D/C is a dual-cure composite core buildup material that enables you to build up just the coronal core or to fabricate a composite post and core that bonds the post, tooth and core together into an integrated whole. NoCord™ VPS is a unique impressioning system that makes impression taking easier. Detailed margins and a perfectly-fitting restoration every time! NoCord™ Wash is the first wash material to incorporate a hemostatic agent to control bleeding and fluid flows. 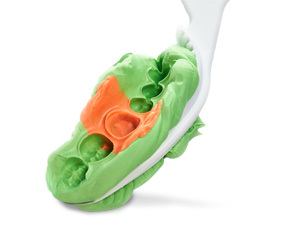 The unique NoCord™ MegaBody® Tray Material is stiffer to displace gingiva and completely capture prep margins with the NoCord Wash Material. We invite you to watch how to create a fast, strong and highly esthetic temporary bridge using Centrix Access Crown. In this video, the patient presents prepped ready for a maxillary 5-unit anterior temp bridge. We get it done in 60 seconds! Waste less and get more! Up to 33% less waste or avg. 12 more temporaries out of each cartridge with Centrix SuperMixer™ Nozzles. Keep patients scheduled in production time, NOT emergency visits by using NoMIX moisture activated take home cement! With your drills and skills and our innovative materials together, We make Dentistry Easier! An effective gingival retraction system that truly harnesses the power of pressure, astringency and time. Never one to hold back, Centrix founder and dentist Dr. William B. Dragan discusses his inventions that became the foundation what Centrix is today. Listen in and learn more!